Rumors of Joe Biden entering the 2016 Presidential race surfaced this week after Biden aides were seen having conversations with Democratic leaders and donors. 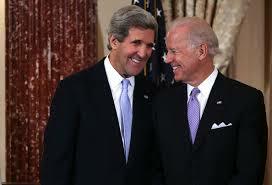 John Kerry has been thought to be considering another run for President as well. While Joe Biden may have renewed interest in a run because of the death bed request of his son Beau, there is really more to this developing election story. The fact that Joe Biden, and possibly John Kerry, are considering challenging Hillary Clinton’s previously insurmountable control over the Democrat nomination is a certain recognition of her growing vulnerability. Recent polls have shown voters consider Mrs. Clinton untrustworthy. A Quinnipiac Poll said 57 percent of voters said Mrs. Clinton was not honest and trustworthy and 52 percent said she did not care about their needs or problems. The same poll showed Mr. Biden with his highest favorability rating — 49 percent …, with 58 percent saying he is honest and trustworthy and 57 percent saying he cares about them. In addition to Mrs Clinton problem with empathy and trust, her growing legal and ethics problems with Benghazi and email accounts combine to reveal to even those in the Democrat circle of power that if they want to hold onto the Presidency in 2016 they may need to begin considering other candidates. Watch as this develops over the coming months simultaneously with Mrs. Clinton’s increasing vulnerability.